What is your favourite part of Beijing? Ask anyone Chinese and I bet a fiver they’ll say the Houhai area. And，I daresay for many foreigners this park and lake is also considered the ultimate hangout. Day or night, Houhai is both sophisticated and cool. In the evenings the lakeside’s shores buzz with activity — people come here to enjoy a relaxing drink and dinner in the bars, cafes and restaurants that line the lakeside. And, during the daytime it is really lovely to spend time walking around the three man-made lakes that make up the Houhai area. It is also the ideal place to get a feel for Beijing’s changing seasons. In winter you see people skating on the lakes and particularly hardy locals diving into their icy depths. But once spring hits, Houhai offers quite a different atmosphere. Ducks are out swimming at this time, while many visitors enjoy boat-rides on the lake. You will also spot sunbathers resting after a dip in the water. Although in recent years Houhai has become yuppified, this part of Beijing has been considered chic for centuries. Houhai and the adjoining lakes of Shichahai and Qianhai are collectively known as the Back Lakes. They were created in the 14th century to berth barges from the Grand Canal that were bringing goods from around China and beyond to the emperor in his nearby Forbidden City. This proximity to the palace is what gives this area its charm, and as you stroll around the lakes you can see the homes that were frequented by the country’s former elite. Former residents include Zaifeng, Prince Chun II, who was the father of Puyi, China’s last emperor. The prince’s mansion and gardens later became the residence of Soong Ching-ling who is sometimes regarded as Asia’s first female non-monarchial head of state. Along with her husband, the revolutionist and political leader Sun Yat-sen, Soong Ching-ling is considered one of China’s most significant political figures of the early 20th century. She was made Honorary President of the People’s Republic of China just weeks before her death in 1981. Today, you can visit the mansion and gardens where she spent her twilight years. The property was converted into a museum in 1982, one year after her death. Another royal who once lived on the shores of Shichahai was Yixin, Prince Gong I, who governed China in the 1860s and 1870s. He is remembered for advocating strong ties with westerners, as well as for his attempts to modernize China. Prince Gong’s Mansion is known as one of the most ornate and extravagant resident compounds in all of Beijing. It is also now open to the public. The revolutionary author Guo Moruo is yet another former famous resident of Shichahai. His home too now serves as a museum. For those who make their way to where Qianhai meets Houhai, you will come across Yinding Bridge. Built in the Ming Dynasty (1368-1644), this ornate stone bridge looks like an inverted Yinding and thus is named silver ingot. Yinding Bridge is a crossroads where bicycles, mopeds, rickshaws and pedestrians all jostle to pass. 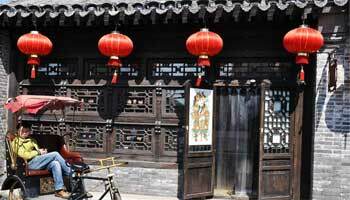 Beyond the bridge you can make your way towards Yandai Xiejie, a hutong that also dates back to the Ming Dynasty. Originally it was known as Dayuting East Street, but later, in the Qing Dynasty (1644-1912), the name changed because the area became associated with tobacco and water pipes. Many tobacco and pipe shop businesses flourished here, but beyond this it was also said that the shape of the street resembled a pipe. Today, the pipe shops are gone. The hutong is now full of knick-knack shops, craft sellers and funky restaurants and coffee shops. The architecture is austere yet elegant here, and Yandai Xiejie is a definite must-see for any tourist who spends a day at the Drum Tower, Bell Tower and/or Houhai. This entry was posted in Travel and tagged Beijing, Houhai. Bookmark the permalink.